A stroke is an injury to the brain due to the interruption of the blood supply, which cause destruction of a portion of brain tissue that can lead to weakness, numbness, paralysis, speech difficulties, confusion or other problems. One of the worst consequences that occurs after a stroke is severe burning pain on the side of the body affected by the stroke. Post-stroke pain, also referred to as thalamic pain, neurogenic pain or central pain syndrome, occurs most frequently following strokes on the right side of the brain, affecting the left side of the body. How does post-stroke pain develop? The precise cause of post-stroke pain is unknown, although it may be due to a hyperactive autonomic nervous system. Because the brain has been damaged, it feels pain when it should be feeling a sensation that is not painful. Common painkillers have no effect on this type of pain. Twenty percent of patients with this condition get better over a period of years. In 30 percent of these individuals, the pain decreases during the first year. What are the symptoms of post-stroke pain? The onset time for symptoms to develop is variable, ranging from days to years after the stroke. Pain can be felt in the face, arm, leg and trunk on the stroke side. Some patients have symptoms affecting the whole side of the body. The pain has been described as burning, aching or pricking in nature. It is usually constant and increases in intensity over time. Movement, changes in temperature or other unrelated stimuli may aggravate the symptoms. The pain is often accompanied by abnormal sensations in the affected body part. Since the precise cause of post-stroke pain, also known as thalamic pain, neurogenic pain or central pain syndrome, is unknown, treatment among the modern medical community has proved to be challenging. For example, common painkillers appear to have no effect on this type of pain. Typical treatments that are tried include stronger pain medicines, muscle relaxants and other drugs; physical therapy; and psychological evaluation and counseling. Anticonvulsants have been used as well to help relieve the pain. Tricyclic antidepressants, which are used to help improve coping skills and pain tolerance, and to restore normal sleep patterns among individuals with post-stroke stroke, are another drug treatment option. The problem with the drug treatment approaches is that not only do they not get at the root of the problem, but they are not always effective, and may have unpleasant side effects. And although physical therapy and counseling may improve the pain, these modern medical treatment approaches do not address the root cause of the pain either. 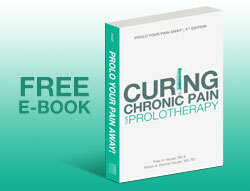 When all else fails, surgery is often the last resort for any type of chronic pain. Surgery options include deep brain stimulation and motor cortex stimulation. 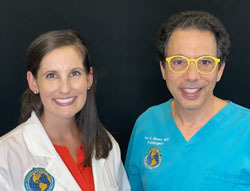 However, both of these options have shown only some measure of pain relief for 50 percent of patients, and excellent or complete pain relief for only a very small percentage of patients. In other words, surgery does not appear to be the answer to treating post-stroke pain either. 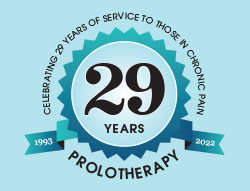 Prolotherapy can be an effective treatment for post-stroke joint pain. It appears to be the stimulation of this growth that is registered in the spinal cord and/or brain that shuts down the pain-provoking stimulus. Since post-stroke or post-nerve injury pain syndromes appear to have no real treatment, Prolotherapy can be an option to consider. We understand that every case is unique and can be more severe or disabling, not allowing a person to travel to one of our clinics. 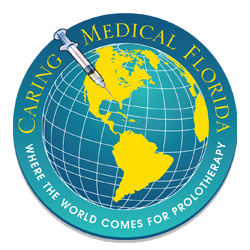 If you feel that you would be able to travel for a series of Prolotherapy treatments (typically 3-6 total treatments, approximately 1 month apart), and would like us to review your case, please contact us directly: info@caringmedical.com.